Introduction: This article is part of the Focus Theme of Methods of Information in Medicine on the German Medical Informatics Initiative. HiGHmed brings together 24 partners from academia and industry, aiming at improvements in care provision, biomedical research and epidemiology. By establishing a shared information governance framework, data integration centers and an open platform architecture in cooperation with independent healthcare providers, the meaningful reuse of data will be facilitated. Complementary, HiGHmed integrates a total of seven Medical Informatics curricula to develop collaborative structures and processes to train medical informatics professionals, physicians and researchers in new forms of data analytics. Governance and Policies: We describe governance structures and policies that have proven effective during the conceptual phase. These were further adapted to take into account the specific needs of the development and networking phase, such as roll-out, carerelated aspects and our focus on curricula development in Medical Inform atics. Architectural Framework and Methodology: To address the challenges of organizational, technical and semantic interoperability, a concept for a scalable platform architecture, the HiGHmed Platform, was developed. We outline the basic principles and design goals of the open platform approach as well as the roles of standards and specifications such as IHE XDS, openEHR, SNOMED CT and HL7 FHIR. A shared governance framework provides the semantic artifacts which are needed to establish semantic interoperability. Use Cases: Three use cases in the fields of oncology, cardiology and infection control will demonstrate the capabilities of the HiGHmed approach. Each of the use cases entails diverse challenges in terms of data protection, privacy and security, including clinical use of genome sequencing data (oncology), continuous longitudinal monitoring of physical activity (cardiology) and cross-site analysis of patient movement data (infection control). Discussion: Besides the need for a shared governance framework and a technical infrastructure, backing from clinical leaders is a crucial factor. Moreover, firm and sustainable commitment by participating organizations to collaborate in further development of their information system architectures is needed. Other challenges including topics such as data quality, privacy regulations, and patient consent will be addressed throughout the project. 2 Rasmussen LV. The electronic health record for translational research. J Cardiovasc Transl Res 2014; 07 (06) 607-614. 3 Sutherland SM, Kaelber DC, Downing NL, Goel VV, Longhurst CA. Electronic Health Record-Enabled Research in Children Using the Electronic Health Record for Clinical Discovery. Pediatr Clin North Am 2016; 63 (02) 251-268. 4 Liao KP, Cai T, Gainer V, Goryachev S, Zengtreitler Q, Raychaudhuri S. et al. Electronic medical records for discovery research in rheumatoid arthritis. Arthritis Care Res (Hoboken) 2010; 62 (08) 1120-1127. 5 Hersh WR. Adding value to the electronic health record through secondary use of data for quality assurance, research, and surveillance. Am J Manag Care 2007; 13 (6 Part 1): 277-278. 6 Dentler K, ten Teije A, de Keizer N, Cornet R. Barriers to the reuse of routinely recorded clinical data: a field report. Stud Health Technol Inform 2013; 192: 313-317. 7 Chute CG, Beck SA, Fisk TB, Mohr DN. The Enterprise Data Trust at Mayo Clinic: a semantically integrated warehouse of biomedical data. J Am Med Inform Assoc 2010; 17 (02) 131-135. 8 Lowe HJ, Ferris TA, Hernandez PM, Weber SC. STRIDE – an integrated standards-based translational research informatics platform. AMIA Annu Symp Proc 2009; 2009: 391-395. 9 Danciu I, Cowan JD, Basford M, Wang X, Saip A, Osgood S. et al. Secondary use of clinical data: the Vanderbilt approach. J Biomed Inform 2014; 52: 28-35. 10 Tian Q, Price ND, Hood L. Systems cancer medicine: towards realization of predictive, preventive, personalized and participatory (P4) medicine. J Intern Med 2012; 271 (02) 111-121. 11 Tanaka H. Omics-based medicine and systems pathology. A new perspective for personalized and predictive medicine. Methods Inf Med 2010; 49 (02) 173-185. 12 Mirnezami R, Nicholson J, Darzi A. Preparing for precision medicine. N Engl J Med 2012; 366 (06) 489-491. 13 Wilkinson MD, Dumontier M, Aalbersberg IJ, Appleton G, Axton M, Baak A. et al. The FAIR Guiding Principles for scientific data management and stewardship. Sci Data 2016; 03: 160018. 14 Schreiweis B, Bronsch T, Stein KE, Nost S, Aguduri LS, Brandner A. et al. An architecture for the integration of clinical data from a PEHR in a regional research platform. Stud Health Technol Inform 2016; 228: 272-276. 15 Brandner A, Schreiweis B, Aguduri LS, Bronsch T, Kunz A, Pensold P. et al. The patient portal of the personal cross-enterprise electronic health record (PEHR) in the Rhine-Neckar-Region. Stud Health Technol Inform 2016; 228: 157-161. 16 Koh HK, Brach C, Harris LM, Parchman ML. 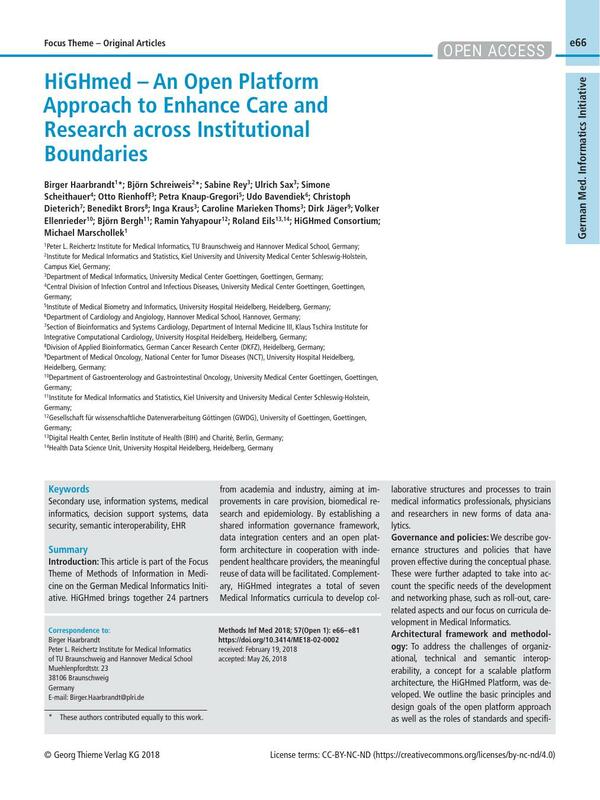 A proposed ‘health literate care model’ would constitute a systems approach to improving patients’ engagement in care. Health Aff (Millwood) 2013; 32 (02) 357-367. 19 Stubbs A, Kotfila C, Uzuner Ö. Automated systems for the de-identification of longitudinal clinical narratives: Overview of 2014 i2b2/UTHealth shared task Track 1. J Biomed Inform 2015; 58 Suppl: S11-S19. 20 Baclawski K, Kilov H, Beale T. Archetypes: constraint-based domain models for future-proof information systems. In: Baclawski K, Kilov H. editors. Eleventh OOPSLA Workshop on Behavioral Semantics: Serving the Customer. Northeastern University; Evanston, IL, USA: 2002: 16-32. 22 Garde S, Knaup P, Hovenga E, Heard S. Towards semantic interoperability for electronic health records. Methods Inf Med 2007; 46 (03) 332-343. 26 Atalag K, Yang HY, Tempero E, Warren J. Model driven development of clinical information sytems using openEHR. Stud Health Technol Inform 2011; 169: 849-853. 27 Ljosland SBakke. National governance of archetypes in Norway. Stud Health Technol Inform 2015; 216: 1091. 28 Wulff A, Haarbrandt B, Marschollek M. Clinical Knowledge Governance Framework for Nationwide Data Infrastructure Projects. Stud Health Technol Inform 2018; 248: 196-203. 29 Leslie H, Ljosland SBakke. Peer Review of Clinical Information Models: A Web 2.0 Crowdsourced Approach. Stud Health Technol Inform 2017; 245: 905-909. 31 Rector AL. The interface between information, terminology, and inference models. Stud Health Technol Inform 2001; 84 (Pt 1): 246-250. 32 Lee D, de Keizer N, Lau F, Cornet R. Literature review of SNOMED CT use. J Am Med Inform Assoc 2014; 21 e1 e11-e19. 35 Seerainer C, Sabutsch SW. eHealth Terminology Management in Austria. Stud Health Technol Inform 2016; 228: 426-430. 39 Haarbrandt B, Tute E, Marschollek M. Automated population of an i2b2 clinical data warehouse from an openEHR-based data repository. J Biomed Inform 2016; 63: 277-294. 40 Haarbrandt B, Jack T, Marschollek M. Automated Transformation of openEHR Data Instances to OWL. Stud Health Technol Inform 2016; 223: 63-70. 43 Mandel JC, Kreda DA, Mandl KD, Kohane IS, Ramoni RB. SMART on FHIR: a standards-based, interoperable apps platform for electronic health records. J Am Med Inform Assoc 2016; 23 (05) 899-908. 44 Marquardt JU, Galle PR, Teufel A. Molecular diagnosis and therapy of hepatocellular carcinoma (HCC): an emerging field for advanced technologies. J Hepatol 2012; 56 (01) 267-275. 45 Acharya UR, Hagiwara Y, Sudarshan VK, Chan WY, Ng KH. Towards precision medicine: from quantitative imaging to radiomics. J Zhejiang Univ Sci B 2018; 19 (01) 6-24. 46 Owan TE, Hodge DO, Herges RM, Jacobsen SJ, Roger VL, Redfield MM. Trends in prevalence and outcome of heart failure with preserved ejection fraction. N Engl J Med 2006; 355 (03) 251-259. 47 Cassini A, Plachouras D, Eckmanns T, Abu MSin, Blank HP, Ducomble T. et al. Burden of Six Healthcare-Associated Infections on European Population Health: Estimating Incidence-Based Disability-Adjusted Life Years through a Population Prevalence-Based Modelling Study. PLoS Med 2016; 13 (10) e1002150. 51 Weber GM, Murphy SN, McMurry AJ, Macfadden D, Nigrin DJ, Churchill S. et al. The Shared Health Research Information Network (SHRINE): a prototype federated query tool for clinical data repositories. J Am Med Inform Assoc 2009; 16 (05) 624-630. 52 McMurry AJ, Murphy SN, MacFadden D, Weber G, Simons WW, Orechia J. et al. SHRINE: enabling nationally scalable multi-site disease studies. PLoS One 2013; 08 (03) e55811. 53 Natter MD, Quan J, Ortiz DM, Bousvaros A, Ilowite NT, Inman CJ. et al. An i2b2-based, generalizable, open source, self-scaling chronic disease registry. J Am Med Inform Assoc 2013; 20 (01) 172-179. 54 Segagni D, Tibollo V, Dagliati A, Malovini A, Zambelli A, Napolitano C. et al. Clinical and research data integration: the i2b2-FSM experience. AMIA Jt Summits Transl Sci Proc. 2013 2013. 239-240 eCollection 2013. 55 Athey BD, Braxenthaler M, Haas M, Guo Y. tranSMART: An Open Source and Community-Driven Informatics and Data Sharing Platform for Clinical and Translational Research. AMIA Jt Summits Transl Sci Proc. 2013 2013. 6-8 eCollection 2013. 56 De Moor G, Sundgren M, Kalra D, Schmidt A, Dugas M, Claerhout B. et al. Using electronic health records for clinical research: the case of the EHR4CR project. J Biomed Inform 2015; 53: 162-173. 57 Chute CG, Pathak J, Savova GK, Bailey KR, Schor MI, Hart LA. et al. The SHARPn project on secondary use of Electronic Medical Record data: progress, plans, and possibilities. AMIA Annu Symp Proc 2011; 2011: 248-256. 58 The European Parliament, The European Council. General Data Protection Regulation. Off J Eur Union 2016; 2014 (March 2014): 20-30.